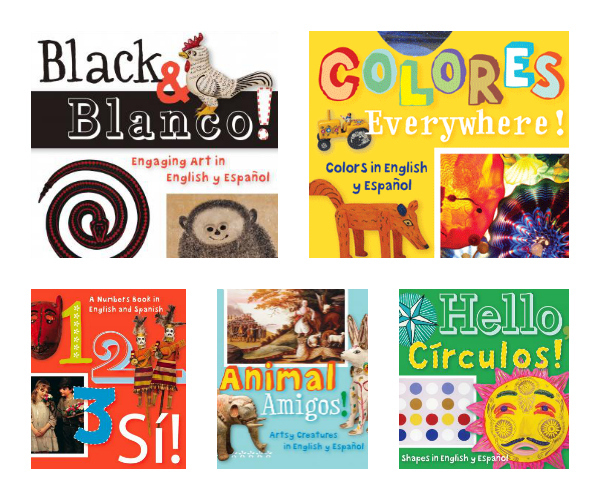 I had the opportunity to review the five bilingual board books that form part of the Arte Kids Books collection: Black & Blanco!, Colors Everywhere, 1,2,3 Sí. Animal Amigos! Hello Círculos! are colorful and full of learning opportunities! The sturdy board books provide colorful images, text in English and Spanish and at the end of each book, an explanation of the artwork that is included on each page. The artwork in the books are quite diverse, coming from all over the world. These books will open a world of color, art and fun to your little one. Make sure you check them out! We’re giving away one set of the entire Arte Kids collection (5 books) to FIVE lucky winners! All you have to do is visit the Arte Kids site and come back here to leave us a comment letting us know which of the five books you’re the most excited about reading to your child. Then, enter the Rafflecopter below. No puedo esperar para leer Animal Amigos! : Artsy Creatures in English y Español, pero no tengo niños, solamente voy a leerlo en mi clase! I’m most excited about Black & Blanco! because it expands on my preschooler’s knowledge of colors and also because the contrast of the colors on the page will be engaging to my 13-month old! I’m already a subscriber to the newsletters! I would love to use them with my classes! I would love to show my bilingual 15 month old “Animal Amigos”. He loves animals! I’d like the Animal Amigos book for my daughter. Babushka does colors, so that’s the book I’d share with the grandbabies. Been a subscriber for un buen ratito. I think that my son would enjoy Animal Amigos! Animal Amigos I think, because Chiquita loves animals. I think we’ve read “1, 2, 3, Si” at the library before. Very cool books! I subscribe. I am excited for the “Hello Circulos” book! Wonderful giveaway! My son would love them all! I would love to read the colores book! I think it’s a great way to get my boys to look at a painting and spot the different colors. Thank you so much for sharing these wonderful books with us. While it’s difficult to choose only one (since these are all fantastic) I would pick “Animal Amigos!” to read to my little one. Hello Circulos! as my son is into shapes right now. He loves books with lots of pictures. Me encantan todos, pero especialmente me gusta el libro de Colores. Gracias! Mi chiquito would love these books! I would love to read the “1, 2, 3, Sí! : Numbers in English y Español” with my son. He loves counting and number books, but I don’t have one in Spanish yet, so this would be perfect! Thanks for hosting a fun giveaway – I am a subscriber to your newsletter! I’m excited about black & blanco! I think it will be a good starter book for my little one! My kids would like to read anything! I am a subscriber, thank you for the giveaway! I did not know about this collection. It looks great! I hope I win! My 8 month old would love it! I would love to read 123si with my little one! One grandma speaks English and the other Spanish, these books are perfect for her! Looking forward to the shapes book. And learning Spanish alongside my son! Colores Everywhere! My infant twins would love looking at the vibrant colors. My first Grandson will be raised to be bi-lingual. These books will be a great addition to his library! Black and Blanco would be a favorite! I’m teaching Spanish to little kids and I’m always looking for good and very illustrative material to show to them. These books look great, but I really like that they not only teach about numbers and colors in Spanish but also about the culture the Spanish language represents and that it’s so important to me. I am excited about the numbers a nd animals one. My 2 year old twin girls would love these books they love looking at books with animals and love to count the steps as they go down. It would help supplement their Spanish vocabulary. I am excited about reading 1, 2, 3, Si! with my 2 year old. He LOVES counting. Just loves it. It makes him happy. I think he’d be thrilled about this book as well as the others. I am a subscriber to the SpanglishBaby newsletter! I am excited to read Black and Blanco and the artsy Animales book with my daughter! We are raising her to be bilingual and I love that these books are the perfect mix of Spanglish and have realistic pictures. Nos gutsta Animal Amigos. The animations look great. I am an email subscriber. I’m most excited about the Hello Circulos book…my son is really into learning his shapes right now. Love them all, but I think the “Colores” is my favorite! All of them look great, but Black and Blanco would be fun because my son was born a few hours outside of San Antonio. I like black and blanco. Thanks. Would love to read 1, 2, 3 si! with my kids. Animal Amigos. My girls love animals! Animal Amigos looks awesome! My daughter is obsessed with making animal sounds, so she’d love this theme! I already subscribe to the SB newsletter. We’d love to read animal amigos! I’m most excited to read Hello Círculos! Love the concept of all the book being bi-lingual. Am most excited about the 1,2,3 Si. I have a young granddaughter that would benefit greatly from it as well as the other books since I am trying to have her learn and maintain the Spanish language. Black & Blanco! : Engaging Art in English y Español sounds exciting.